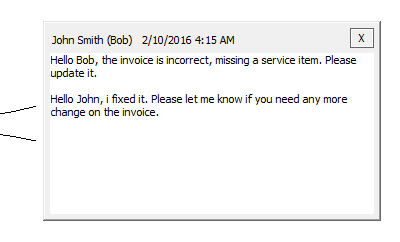 A Comment object can be placed on a Tiff document for comment or add information for the document. The comments will displayed in the document with a small “Comment” icon, and once the user clicks on the icon, the comment editor appears where user can enter text. The comment editor can be closed by clicking on the X button on the top-right corner of the comment editor, and can be displayed any time by clicking on the comment icon on the document. Comments can be saved as a separate file or stored in the TIF file header data tag. Comment icon background color and opacity can be customized by selecting a comment icon, and clicking on the Comment tab in TIFF Viewer. The comment editor can be customized by right-clicking on the comment text, and selecting the needed option from the appearing context menu. For customizing the text color, size, family select the Set Font… option from the context menu. For changing the alignment, select the Text Align Left, Text Align Center or Text Alight Right option. For copy and paste text, select the Copy text, Cut text, Paste text option. The comment editor contains the name of the user who edited the text last time, and the date/time of the last change.